Let’s face it. You’ve probably daydreamed about being on a TEDx stage, talking about your expertise, your passions, and your ideas. This daydream doesn’t even have to be set on a TEDx platform. It could be any other place, as long as there’s a huge audience waiting to be blown away by what you have to say. But how and where does one really start? How do you turn that entry on your bucket list into a ticked off box on your to-do list? 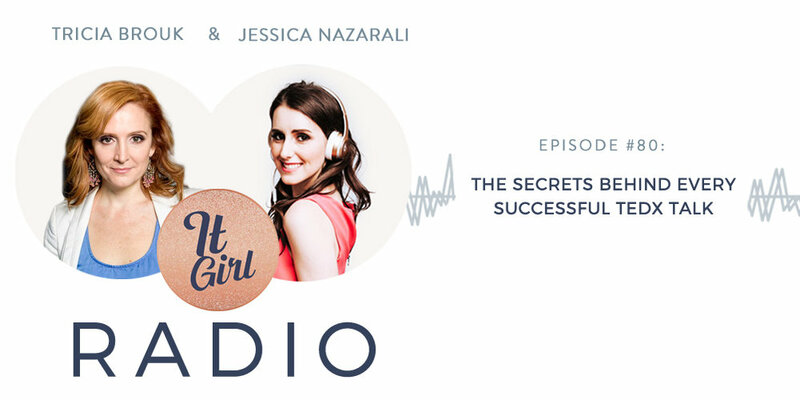 On this episode of It Girl Radio, we’ll learn about how you can do just that from Tricia Brouk, Executive Producer and Creative Director at TEDxLincolnSquare. We’ve all had our fair share of those “Aha!” moments. And for each lightbulb moment, we’re often just bursting at the seams, itching to share it with the rest of the world. Of course, the excitement is soon after replaced with anxiety and fear. How will people react? Are our ideas worth sharing? Will people dare to listen? The good news is, Tricia knows exactly how you feel. She has worked with countless speakers and performers who have had the same gut-wrenching feeling you’re feeling now. She has also encountered so many people who thought that the TEDx stage will be nothing more than just a dream. Because of her background as a writer, director, and choreographer, she has mastered the art of putting things into perspective for people like you. She knows how to make you take that leap from where you’re standing to where you want to be. After all, it only takes one step to trigger a chain of events that will trigger the change you are waiting for. Tricia also talks about setting the right mindset and knowing how to start turning your ideas into a big message that will truly make an impact. After all, any big talk is essentially just a lecture – but in a form that is more relatable, more engaging, and most importantly, more enjoyable. It’s not just about presenting your idea. It’s about making people realize that your idea can make an actual impact in the way they live their lives. Join us as we discover what the secret is to every successful TED talk. Let’s explore the nitty gritty of what happens behind the scenes. One day, you’ll look at a sea of audience in front of you and say, “Tricia was right.” All it takes to start your journey toward that future is deciding to listen to this podcast today. (07:50) How long does the entire process take? (08:36) The don’ts in presenting any big talk?